IEC 60320 C14 C13 Power Cords | World Cord Sets, Inc.
IEC 60320 C13 to C14 power cords are stocked in lengths from 1 through 50 feet. Our large length selection cords allows you to choose the cord that meets your requirements. Our standard jacket color is black. Other colors available are white, gray, blue, green, red, yellow, orange, pink, and purple. Custom colors are available upon request. We also offer a wide range of locking C14/13 power cords. Locking cords allow you to securely connect your power cord to your server and/or PDU, ensuring they don't become accidentally disconnected. We carry P-Lock, A-Lock, V-Lock, and W-Lock C14 C13 power cords. 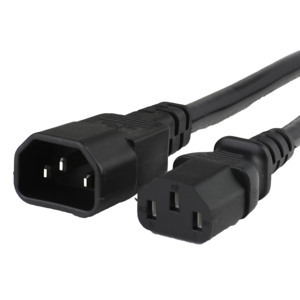 IEC 60320 Power Cord Sets feature a C14 male plug on one end, and a C13 female connector on the other end. These are commonly found in Data Centers, Networking Closets, and any other type of IT installation, or, in the home or office as an extension cord. In the data center, C14 to C13 power cord sets are used to "jump" power from a Power Distribution Unit (PDU) to a piece of IT equipment such as a Server, Router, Switch, or Firewall. Because these are used in the data center, they can be found from stock in many different colors and lengths. Different colors are used to color code an installation, and each data center typically has its own method of color coding its power path and racks. However, a common method is using Red and Blue power cords to color code each circuit. Read our article on "Color Coding IT installations" for more information this topic. Different lengths are required to ensure that the cord sets do not take up excess space in the rack, which could lead to the rack overheating. 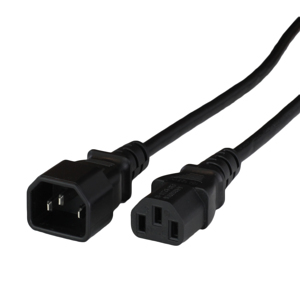 Right length power cords are used to increase airflow, and decrease the chance of a cord being snagged on something and coming disconnected from the PDU or Equipment. Choosing the correct C14 to C13 power cord set can seem like a daunting task at first glance, between the different amperages, jackets, colors, lengths, and locking styles, there are a multitude of options to choose from. However, continuing to read below will help you make an informed decision on which cable is right for your needs. 10 Amp : 10 Ampere rated C14 C13 cord sets utilize 18awg (or 1.00mm2) conductors, and, are the thinnest conductors available. If your equipment operates at less than 10A, and space is a concern, the 10A cable is right for you. 15 Amp : 15 Ampere rated C14 C13 cord sets utilize 14awg conductors, and are a heavy duty option. If you are unsure of how many amperes you equipment requires, or you are simply looking for a heavy duty cable, this is the cable for you. If you are looking for locking cord sets for devices you are manufacturing, our A-Lock (also known as Auto-Lock) cord sets may be the right choice for you. These provide a secure locking mechanism on the female (C13) end of the cable. The A-Lock C13 locks into place by grabbing the grab pin on the mating inlet. The A-Lock unlocks by squeezing the tabs on the size and pulling. SVT (Service Vacuum Thermoplastic) - The SVT jacket is the thinnest jacket available, and, is only available with 18awg conductors. SVT jackets have a thickness of ~ .015in (.38mm) and when used with 3 conductor 18awg wire, has a nominal OD of ~ .245in (6.2mm). SVT jackets are commonly found in high density data centers where the every cubic inch of space is valuable. The SVT is is made of PVC (Polyvinyl chloride), which is a robust synthetic plastic polymer providing high durability. SVT jackets are not oil or water resistant.